Lynsey is a certified Professional Dog Trainer, certified Trick Instructor, and a member of the Association of Pet Dog Trainers (APDT). She is an evaluator for the APDT Canine Life and Social Skills (C.L.A.S.S.) program, the American Kennel Club's Canine Good Citizen program, and the United Kennel Club. A graduate of the Tom Rose School for Professional Dog Trainers, Lynsey attended both the Professional and the Master Trainer programs. With a Bachelors degree in Education, Lynsey is skilled at teaching owners, in addition to their dogs. Since 2003 she has been working with dogs at various kennels, at her own boarding/daycare/training facility, and individually in and around the St. Louis and St. Charles areas. 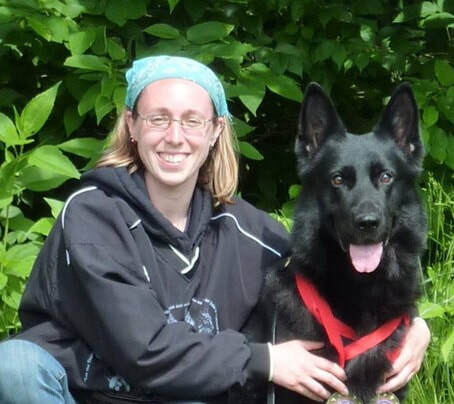 In addition to working in the pet industry, she is also a trainer for Logan Haus Kennels Canine Trainer's Course, as well as a trainer with Got Your Six Support Dogs. She has experience with a wide variety of breeds and mixes of all ages, sizes and types. She regularly fosters and rehabs dogs for placement into ﻿permanent homes. With her own personal dogs, she has been training for years in various dog sports (including Agility, AKC Obedience, Rally Obedience, Iron Dog Events, Dock Diving, Barn Hunt, and Schutzhund/IPO) and has competed at a national level. She follows the theories of operant conditioning and, through continuing education programs, stays up to date on the most current theories and practices of positive dog training. ​• Join us on Facebook!